Join BYP for our January social with the Rochester City School District (RCSD). Come out and make some new connections with young professionals in the Rochester area. The RCSD will discuss current employment opportunities within the organization. Appetizers will be served. Please RSVP/confirm that you will be attending here. Thank you to the Rochester City School District for sponsoring the event, and we look forward to seeing everyone there! BYP is accepting applications for Teen University! Teen University, aka Teen U, is a program focused on helping high school students (grades 9 - 12) to develop essential professional and life skills. Our goal is to ensure their success in college and beyond. Topics will include goal setting, personal branding, financial awareness, networking, etc. Spots are first come, first serve. To register, please go to www.rocbyp.org/teen-u-application. In addition, we are looking for volunteers to assist. Those interested in volunteering should email byp@ulr.org and with the subject line: Teen U Volunteer. Special thank you to our sponsor Avangrid Foundation. Come out to the March BYP Social Event!! Join us for a chance to mingle and network at one of Rochester's newest establishments! This will be your chance to meet the Bachelors and Bachelorettes for the upcoming 6th Annual Date Night Auction. You don't want to miss this event!! Before there was J. Lo, there was Gloria. BYP has partnered with the Rochester Broadway Theatre League to offer discounted tickets for a showing of "On Your Feet", the life story of Gloria and Emilio Estefan. Paid members who purchase tickets will receive two drink coupons! Tickets can be purchased by completing the form below. Ticket purchases will be manually entered by Rochester Broadway Theatre League staff upon form submittal. If you prefer to use a different payment method, please call Sarah Hudson at 585-277-3325. Come out for an evening of networking, mingling, and giving thanks to start of the holiday season. BYP Members - FREE; food donation encouraged. Guests - FREE with a food donation; $5 without donation. Non-perishable food donations will go towards programs that serve those in-need/at-risk. Urban League of Rochester, NY Inc. Please register by email to ssimson@ulr.org or here. Join BYP as we travel the Niagara Wine Trail for our third wine tour. The tour will include four wineries and lunch. After September 1st, tickets will be $50 for everyone. To purchase your ticket, please go here. Join BYP at the Hyatt's NEW rooftop deck as we celebrate our 5th anniversary with a brunch social! **Cash bar will also be available for cocktails. Price includes brunch buffet and open mimosa bar from 1:30PM - 3PM only! Join us for our summer service event as we assist Ronald McDonald House Charities with retrieving and sorting donations from cars for their Fall House 2017 Household Sale. We're looking for 10+ volunteers, ages 17+. This is perfect activity for high school seniors looking for community service or those with college-bound mentees. If you're interested in volunteering, please email BYP Co-Community Service Chair Brian at brismith636@gmail.com. The Household Sale is the Ronald McDonald House Charities of Rochester's largest fundraiser. Proceeds support families that needs a home-away-from home while their children are receiving care at Rochester area hospitals. For information on donating to the Household Sale, please go to www.rmhcrochester.org/household-sale/donate-household-sale. Join us for our June social event as we present Battle of the Sexes Bowling at Radio Social. Come out to bowl, network, or just hang out! Located in the historical Stromberg-Carlson warehouse, Radio Social is one of Rochester's newest establishments, and features an in/outdoor games, restaurant, bar, music venue, and social club. Attendees are encouraged to RSVP in advance. Those that wish to bowl MUST ARRIVE BY 6:30 P.M. to secure a spot. RSVP/Payments can be made here. ** Member option coming soon. The Rochester Black Young Professionals are proud to present the 3rd Annual Salute to Excellence - Honoring Rochester Area College-Bound HS Seniors! This is a celebration to honor local college-bound high school seniors on their success! Professionals are strongly encouraged to attend and show their support. In addition, this provided the opportunity for HS seniors to be matched with a local professional that wishes to serve as a mentor. Note: This is a COMMITMENT. We ask those that participate to be active and dedicated. The evening will include refreshments, and select speakers. If you are a HS senior that is interested in having a mentor OR a professional that is looking to mentor, please register here. The dress code for the event is business casual. Students: No hats, hoodies or sneakers. Nice slacks, jeans, skirts, dress along with tucked in dress shirts, polo shirts, or tees. Please share with any college-bound HS seniors you know, and we look forward to seeing you there! Melanin May is back!! This is an event you don't want to miss. Eta Rho Lambda Chapter - Alpha Phi Alpha Fraternity, Inc.
Delta Nu Omega Chapter - Alpha Kappa Alpha Sorority, Inc.
Theta Omicron Chapter - Omega Psi Phi Fraternity, Inc.
Rochester Alumni Chapter - Kappa Alpha Psi Fraternity, Inc.
Rochester Alumnae Chapter - Delta Sigma Theta Sorority, Inc.
Theta Alpha Zeta Chapter - Zeta Phi Beta Sorority, Inc.
Psi Omega Zeta Chapter - Zeta Phi Beta Sorority, Inc.
Theta Omega Sigma Chapter - Sigma Gamma Rho Sorority, Inc.
Light refreshments will be served, and a special melanin drink will be on deck. Ladies and Gentlemen, BYP's Annual Date Night Auction is coming up, and you won't want to miss it! Get your tickets today! Looking to promote your business? Check out the vendor and sponsorship opportunities for the auction! BYP is hosting a cookout. Music, drinks, barbecue...and best of all, it's free. What's not to love! Be sure to RSVP below so that we know to save a spot for you. This event is not to be missed. Ladies and gentlemen, it's that time of year again. The event you have been waiting for is finally here. BYP invites you to join us for the Fourth Annual Date Night Auction! Proceeds from this event are donated to the Urban League's Black Scholars Program. Tickets can be purchased here. Want member pricing, but haven't joined BYP yet? Join today! BYP is hosting their annual holiday party with a twist - an ugly sweater contest! Join us at Tajze Wine and R&B Lounge as we celebrate with a special drink of the evening. Want member pricing, but haven't become a member yet? Click here to join BYP! CHANGE OF VENUE: Due to unforeseen circumstances the Happy Hour will now take place at Tajze's. 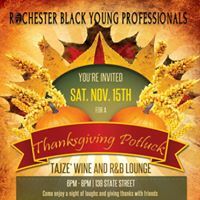 Join us as we patronize one of Rochester's favorite Black-owned establishments, Tajze's Wine and R&B Lounge! Come out for an evening of networking, mingling, and to celebrate the start of the holiday season. With the season of gratitude upon us, BYP is making this a FREE event as a way to show our appreciation to our supporters. Attendees are encouraged to bring a generous canned good/non-perishable food donation that will go towards individuals in need. Trick or treat! You're never too old to celebrate Halloween. So get your costumes ready and come party with us on October 30. Tickets can be purchased here. Want member pricing, but haven't become a member yet? No worries. Join BYP today to enjoy all of our exclusive member benefits! 10/29 ONLY: Buy one ticket, get admission for a second guest FREE. Buy your ticket today. This is a deal you don't want to miss!!! Pssst... are you having trouble purchasing tickets using the link above? Click here to be redirected. Tickets are no longer available for purchase. Click the picture to purchase your tickets. The Rochester Black Young Professionals proudly invites you to our 3rd anniversary celebration - the Turn Up Brunch. You read that right! Come out and enjoy good music and amazing Louisiana cuisine. Early bird tickets are on sale now here. Want member pricing, but haven't become a member yet? Join the Rochester Black Young Professionals today! Join us for a lively evening filled with dancing and socializing. 2015 BYP members attend free of charge. Not a member or haven't renewed your membership? You're in luck! Click here to join during our open enrollment period, and save. Plan on joining us? RSVP here. Spread some holiday cheer, and have a blast in the process. This year, BYP will be hosting their annual holiday party at Legends Bar & Grill - located inside of the Clarion Hotel in downtown Rochester. Parking will be validated and we have BOGO drink specials. Want more? You got it. Members can bring two guests for FREE! You heard that right. TWO FREE GUESTS. We ask that attendees bring an unwrapped toy to be donated to a local charity. Can't wait to see you there! Did you know that at any given point in time, the Urban League of Rochester facilitates 25+ programs. Subsidized housing, assistance for individuals with disabilities, and college scholarships are just a few of the programs offered through this great community resource. BYP is proud to represent the Urban League for the second year in a row through the United Way's "ROC the Day" campaign. During this 24 hours of giving, we will be turning up the fun with a social media challenge then ending at Marshall Street Bar & Grill for Happy Hour. This is an event you don't want to miss! Join us for our second annual Thanksgiving Potluck! Prizes will be awarded for best meat, side, and dessert. Please bring a non-perishable food item for donation to a local food bank. Admission is $5/person...free if you bring a dish to pass. See you there!